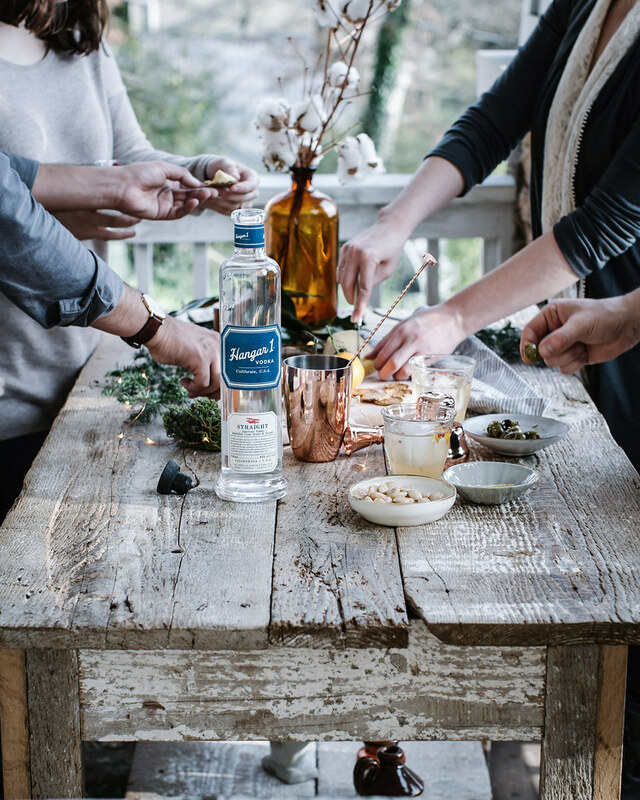 During the holiday season I like to create one go-to holiday cocktail for guests whether they’re dinner guests, just drop in, or friends that have come by to help out with holiday wrapping or bake with me. That way I always have something to offer, and I don’t have to think too hard about it. 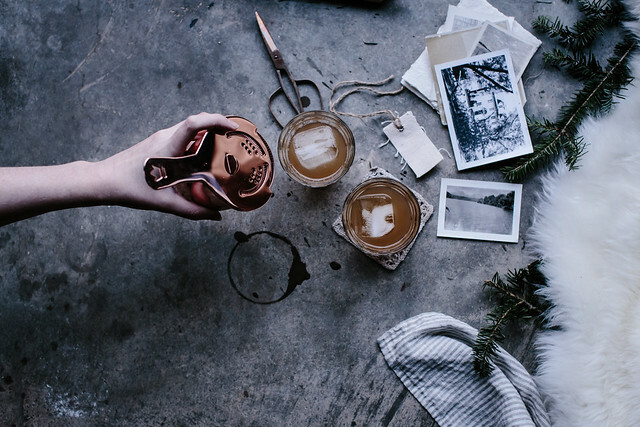 Kombucha has been my go-to mixer all year, and winter is no different. 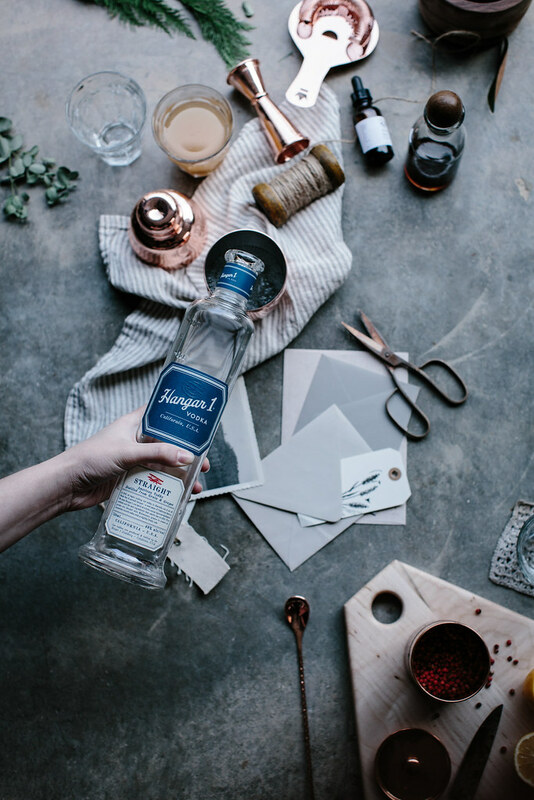 Paired with Hangar 1 Vodka, a clean, high-quality vodka, spiced lemon simple syrup, a dash of bitters, and a sprinkling of pink peppercorns it’s just interesting enough to feel special for the season but simple enough that you don’t have to have a million ingredients to make it happen. I love mixology, both virgin and not, but I don’t like it when drinks get so complex they’re impractical. Those are great for mixologists or hobbyists, but for most of us, we’re not going to keep all of that on hand. This can be made with nothing but Hangar 1 Straight Vodka, kombucha (which I always have on hand because I’m addicted, I prefer the ginger variety for this drink), bitters (I use some that my friend makes but standard angostura or aromatic bitters would work too), lemon, sugar, and water. And a few pink peppercorns to make it festive and add complexity. If you don’t have them and can’t find them, don’t worry. It’s great without them too, but I love the unexpected twist. With Christmas fast approaching, I’ve looked for any and every reason to get together with friends & to make time for my favorite holiday traditions. It hasn’t been easy. Every year I promise myself I won’t work during the holidays as much, that I’ll find time to enjoy baking and decorating and family. But this year, like years past, I’ve managed to over extend myself despite every intention not to. So what do you do when you realize that there’s too much to do and too little time? It’s simple. You relax. You enjoy what you have, you put on simmer pots that make it smell like Christmas even though there wasn’t time for a tree this year, and put on your favorite Christmas music (my vote is always for either Charlie Brown Christmas or the She & Him Christmas album). The time we have is the time we make. I recently read that one of the biggest lies we tell ourselves is that we don’t have enough or aren’t enough. So this season, here’s to remembering, we have enough and we are enough. 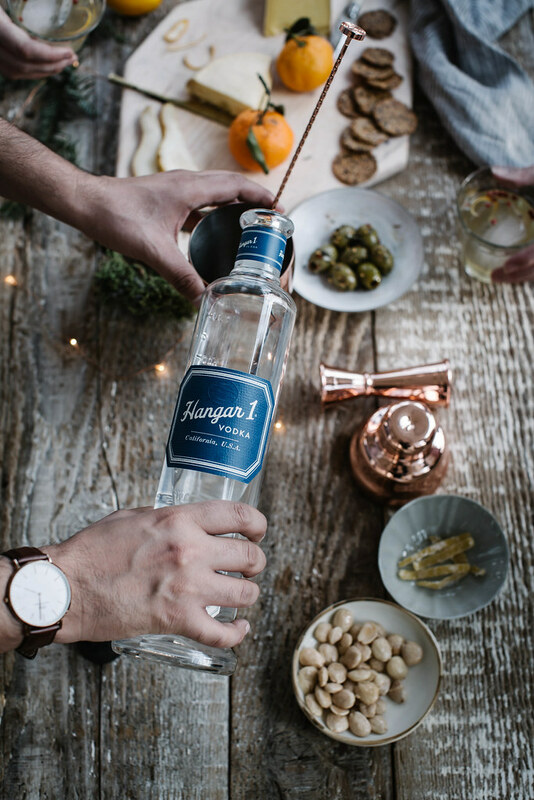 This post was created in partnership with Hangar 1 Vodka. All thoughts and opinions are my own. 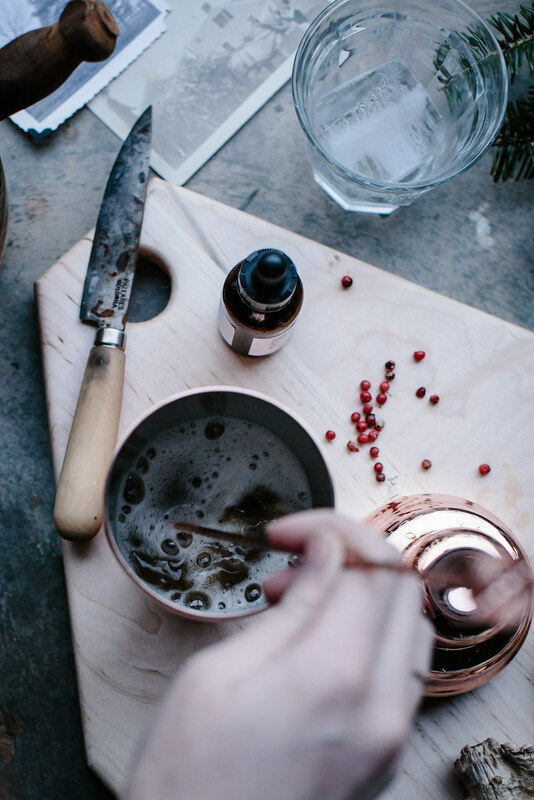 To make simple syrup, heat the sugar and lemon juice along with the cinnamon stick over medium heat, stirring until sugar dissolves and it almost comes to a boil. Remove from heat and cool to room temperature before using. Can be stored in the fridge. To make the cocktail, stir all the ingredients together in a cocktail shaker, and divide evenly between four glasses. 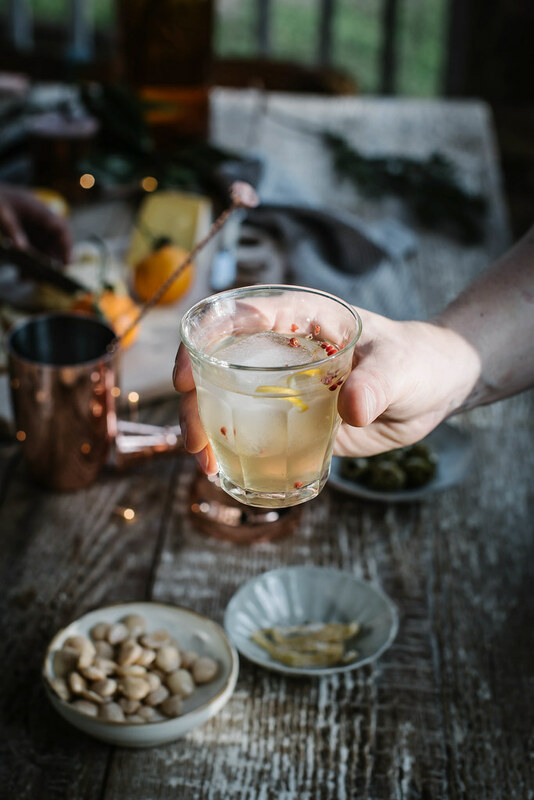 Serve over ice and garnish with a lemon twist and a few pink peppercorns. Beth, these pictures are simply breathtaking!!! My eyes are so happy right now! :). This cocktail looks fantastic and I love the simplicity. 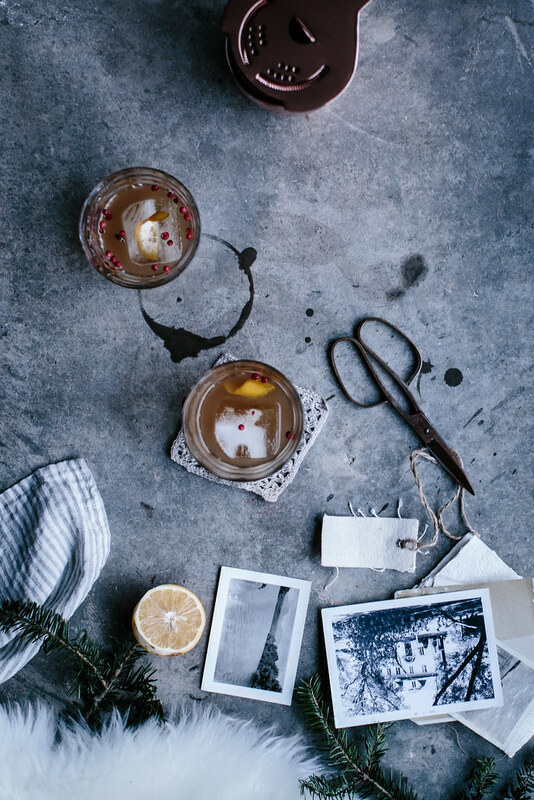 I love your idea of making one cocktail for the holiday season and keeping those key ingredients on hand! So inspiring! I bet this cocktail taste as good as it looks! This is a brilliant idea. Just perfect for this season. Thanks for always sharing and inspiring your readers. What’s kombucha? I’ve never heard of it. Wonderful to simplify Christmas and share what’s truly important!! Since I always have a batch of kombucha brewing… perfect!! Enjoy the holidays!! Stunning photography here – just makes me want to dive right in! Gulp. 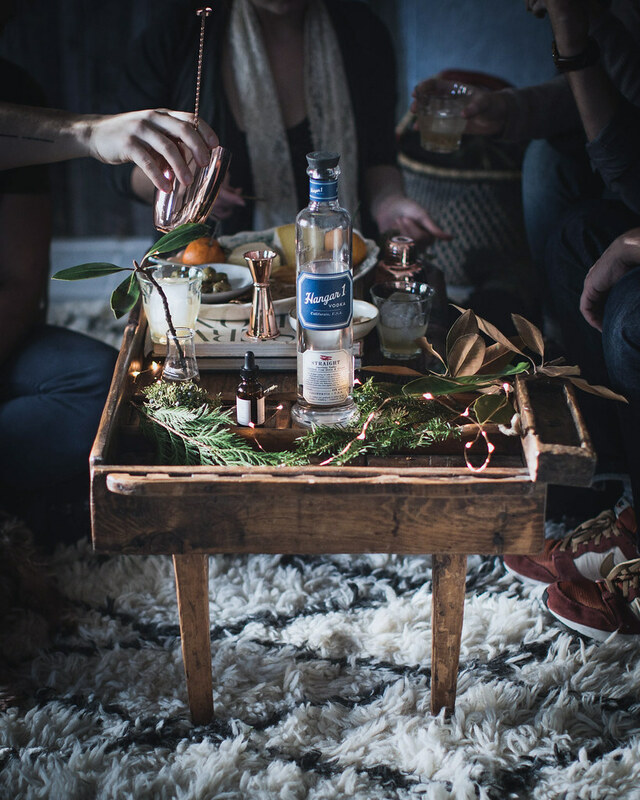 I don’t even like alcohol, but….this looks so refreshing! And what lovely pictures, Beth! 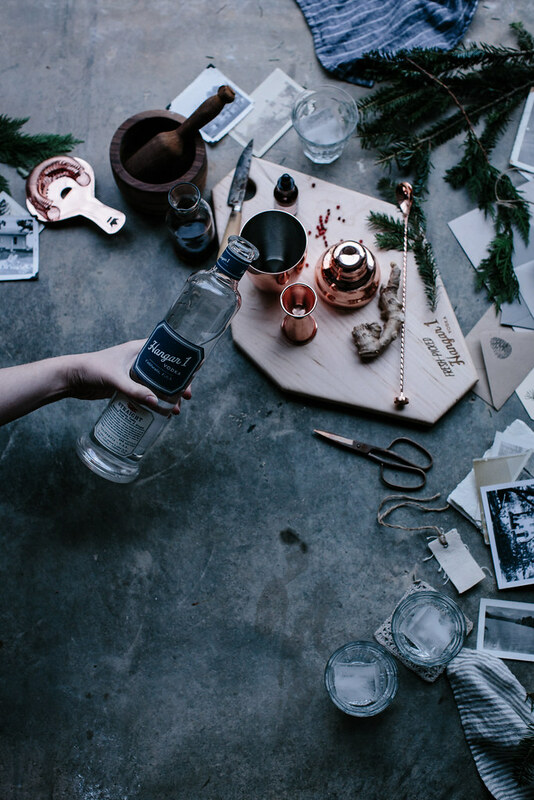 This is absolutely stunning photography and I’m definitely going to have to hunt down the ingredients to make this drink. It looks delightful! 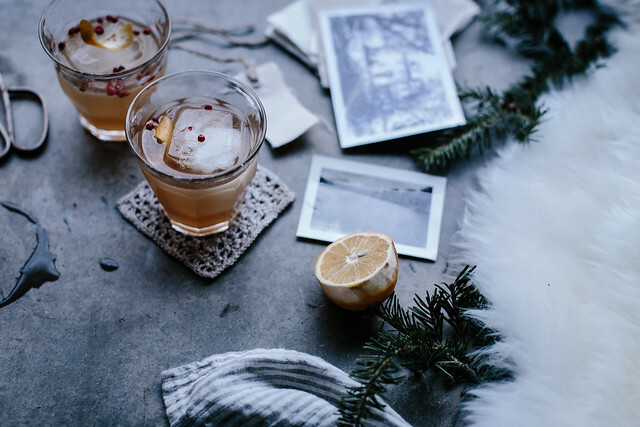 This looks like a perfect cocktail for the holiday season. Thank you for this! these cocktails look gorgeous. can’t wait to try them! Love this! 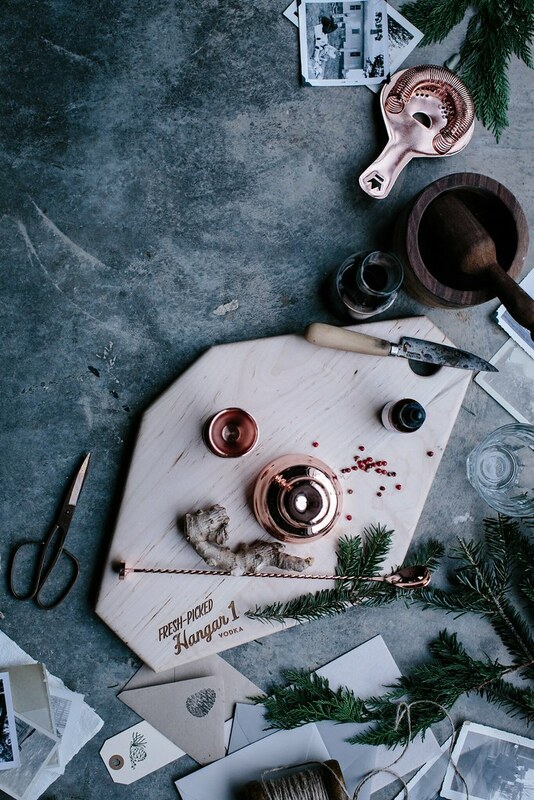 I love copper and was thinking of buying more pieces for my kitchen, but I’m so worried about cleaning it. Is it a lot of upkeep to keep it looking shiny and new? Too bad you didn’t tell us how to make the ginger kombucha. I just my first scoby for Yule and was looking forward to a new recipe. 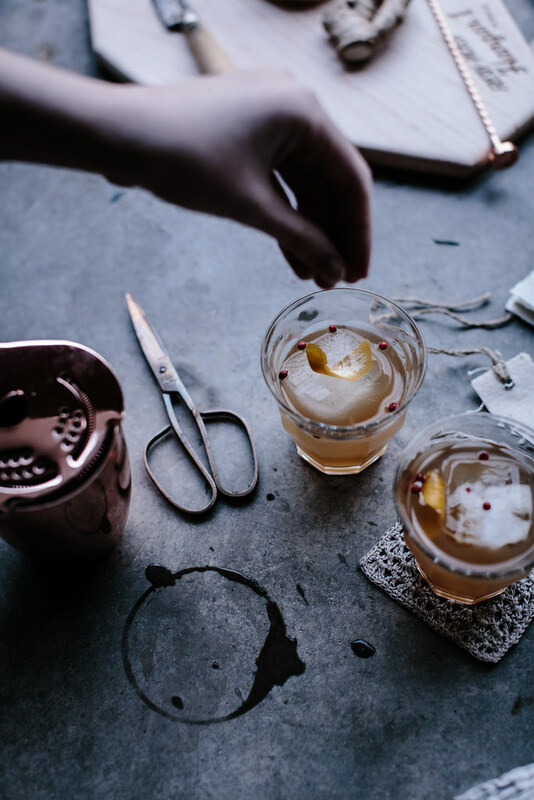 I actually just received a cocktail kit during the holidays and was scouring the internet for the perfect recipe – who else to trust with the best mix but yourself! Thanks for posting. Rue that i missed this beautiful holiday cocktail of yours (ginger kombucha and vodka) that could have been a perfect drink last January 6 Reyes fiesta. I serve it up next time for sure. My favorite Christmas album oscillates between Charlie Brown and John Denver’s Classic Christmas. And even if I must put the tree down, I refuse to take them off the player. Ginger Kombucha in a cocktail is a stroke of genius. I really adore the rug in the 4th photo, can you tell me where it’s from? The quality of the photography involved here is absolutely outstanding. 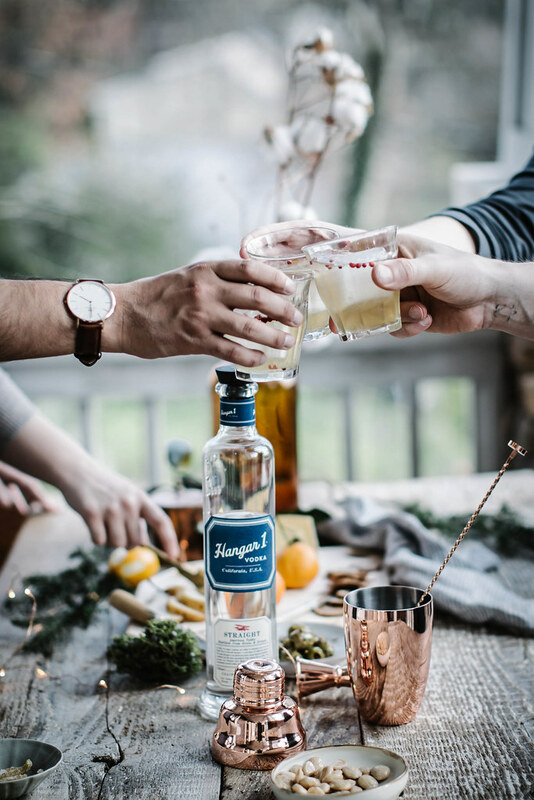 I have never heard of Hangar One vodka before, and usually hate advertisements but I would love to see these images in Lucky Peach or similar magazines. They inspire a feeling of class and presence that is lacking in other food blogs. Please continue to provide us with phenomenal photography and recipes. Lovely drink. 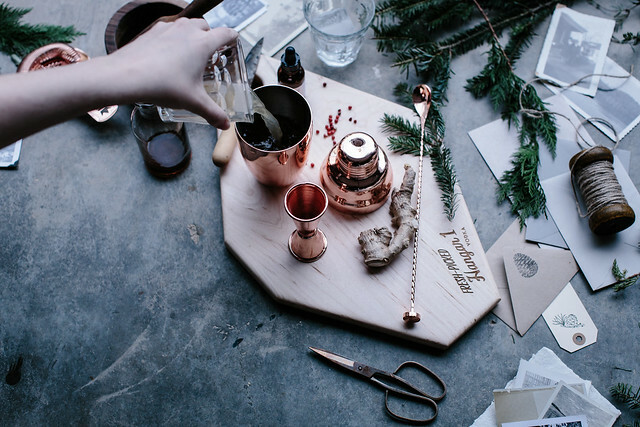 It’s everything the health nut and the Moscow mule lover in me crave wrapped into one. I once mixed mango kombucha and vodka, and dubbed it ‘vodbucha’! Less elegant than what you’ve created. This sounds amazing! And of course your photos always make me swoon! And all that copper!! Oh wow. What wonderful pictures you take! Pink peppercorns impart such a lovely taste unlike regular black or white pepper.